We offer the widest variety of rare OEM and after market tuning and styling parts for German and European cars. 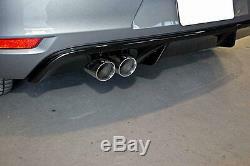 VW Golf 6 Lower Rear Bumper Diffusor Spoiler. GTI Design For Single Outlet Muffler ONLY. Easy And Fast To Install. The brand new lower rear valance for VW Golf MK6. This GTI Design spoiler fits on. And gives your car an unmistakably authentic sport appearance. Will fit non GTI models ONLY!! It's made of strong durable ABS plastic. Easy and fast to paint. All parts and products we sell are NOT OEM but replacement/repair parts, if not otherwise stated. All products and parts we sell are intended for repair and/or show only. They will be safely packaged and can withstand any problems that may arise in transit. Requests for other methods cannot be accepted. Continental USA (48 ground states). PR, HI, AK, APO, FPO (all box numbers). (weekends and holidays not included). We are not responsible for the transit time from our carriers and forwarders. Due to unexpected situations it may happen that an item is not in stock or on delay. From our US & Canadian customers. OriginalEuro is a name and does not indicate in any way the origin of the products. We are not responsible for falsely ordered items. If you don't know, please search the forums for your particular vehicle and learn about the part first. Due to numerous options and custom setups, we cannot provide 100% background and fitment for every vehicle ever made. Please understand that our images can differ from the original item if we use multiple suppliers or production series. Use of this product is voluntary and the user accepts all responsibility for correct use and installation. Some parts may not be legal for street use. Some products are Euro-spec or Asia-spec which may need modification for installation and may not conform to US-specs. All body and tuning parts which are intended to be sanded, primed and/or painted or designated for other finishing processes can show smaller marks, scratches or other minor imperfections on their surface. This is a regular industry standard and not a damage and it does not reduce the usability of the product. We always recommend professional installation if you do not have the experience or knowledge to do so. The products we sell are for described uses only! We are here to help and support you. In order to provide help and support it is necessary to provide us with clear and actual photographs of the products, its damage or fault and/or photographs of the car (and its specs). OriginalEuro is not related in any way to Volkswagen & Audi AG, BMW, Mercedes Benz Porsche nor any other company mentioned on the sites unless otherwise stated. OriginalEuro continually checks and updates the information provided on its website. Despite thorough checks certain data may have changed since posting on the site. The company can therefore not assume any liability or issue any guarantee for the information provided being current, correct or complete. Every effort has been made to provide accurate and complete information. However, we cannot guarantee that there will be no errors. OriginalEuro does not assume any legal liability for the accuracy, completeness, or usefulness of any information, product, or process disclosed herein, or represents that use of such information, product, or process would not infringe on privately owned rights. The appearance of external hyperlinks does not constitute endorsement by OriginalEuro of the linked web sites, or the information, products or services contained therein. Unless otherwise specified, we do not exercise any editorial control over the information you may find at these locations. It may also be used to respond to their inquiries, and/or other requests or questions. User will also receive emails that may include company news, updates, related product or service information, etc. 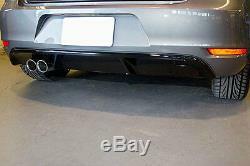 The item "VW Golf MK6 6 GTI Style Lower Rear Bumper Spoiler Lip Sport Valance Diffuser GT" is in sale since Friday, February 24, 2017. This item is in the category "eBay Motors\Parts & Accessories\Car & Truck Parts\Exterior\Grilles".